Unprecedented wildfires in Tennessee’s Smoky Mountains have killed three, forced the evacuation of thousands, and damaged hundreds of structures in the resort towns of Gatlinburg and Pigeon Forge. Residents are bracing for a potential fourth day of fires as the forecast calls for high wind and lightning. High winds and severe drought conditions have created ideal conditions for wildfires that have been sweeping through the US Southeast for weeks. 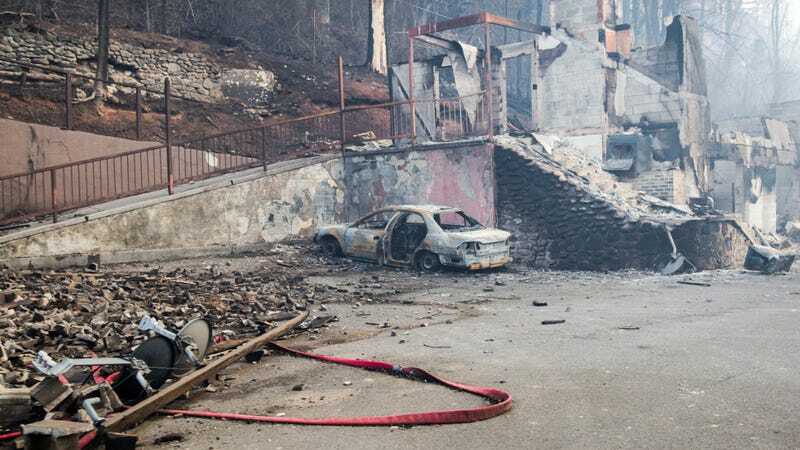 On Monday, strong gusts of up to 90 mph (145 km/h) winds scattered embers across the Great Smoky Mountains National Park into nearby communities, spreading the flames into inhabited areas, including popular tourist attractions. The fires spread dramatically over the period of 24 hours, taking officials off guard. More than 200 firefighters poured into the area, coming from as far west as Memphis. A number of evacuation centers been opened, sheltering well over a thousand residents. Above: Harrowing video as Michael Luciano narrowly escapes the flames (profanity warning). Adding insult to injury, the strong winds knocked over power lines, causing even more fires and knocking out electricity in thousands of homes. In the resort town of Gatlinburg, a number of structures burnt to the ground, including Westgate Smoky Mountain Resort & Spa. Around half of the 10-square-mile town has been affected, with more than 100 homes and buildings damaged, including a 16-story hotel and apartment complex. Other resorts that appear to be affected include Westgate, Black Bear Falls, and Ober Gatlinburg, an amusement park and ski area. Pigeon Forge is home to Dollywood, the theme park founded by singer Dolly Parton. Park guests were evacuated as the flames approached, but the park has (so far) been spared from any damage. Guests were also evacuated from rooms at the park’s DreamMoore Resort and from 19 cabins on the property. It’s not clear what started the fires, but fire officials are hinting that it was human-caused. The worst may be over, but that depends on what happens tonight; the forecast calls for up to two-inches of rain, which could be both a blessing and a curse. Lightning might start more fires, and the rains could produce flash floods. Gatlinburg Mayor Mike Werner called the forecast “ominous,” saying: “We may spend this evening fighting more fires.” The mayor is imposing a 6:00pm to 6:00am curfew, telling residents to boil their water. The fires in Tennessee are part of a larger series of fires that have been ravaging the southeastern US in October and November. According to the US Forest Service, more than 30 large wildfires have scorched areas in North Carolina, South Carolina, Georgia, Tennessee, Alabama, and Kentucky.